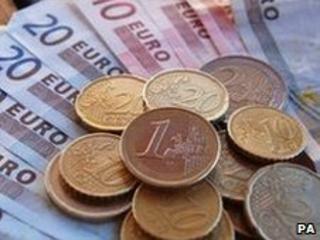 EU finance ministers have given final approval for Estonia to adopt the euro as its currency on 1 January 2011. Meeting in Brussels, they decided to use the existing exchange rate of 15.6466 kroon to one euro as the final conversion rate. The tiny Baltic state, population 1.3 million, will become the 17th member of the single currency. It met entry requirements on inflation, debt and deficit levels, interest rates and currency stability. Of the EU's 27 member states, 16 currently have the euro as their currency. Belgium, Germany, Greece, Spain, France, Ireland, Italy, Luxembourg, the Netherlands, Portugal, Austria and Finland adopted the currency in 2002. Slovenia joined in 2007, followed by Cyprus and Malta in 2008, and Slovakia in 2009.